Mish's Global Economic Trend Analysis: Law of Excuses: It's Always Something (But Never the Right Thing)! Law of Excuses: It's Always Something (But Never the Right Thing)! The out-of-the-blue excuses countries come up with for not making budget deficit targets are rather amusing. For example and via translation from La Vanguardia, France Blames Deficit on Jihadist Terrorism, Lack of Inflation. French Prime Minister, Manuel Valls, said today that his country's military missions against jihadist terrorism, along with public investment in education and security make it difficult to meet deficit limits. "If we reduce our military budget, where are we going?" In regards to "where are we going? ", I have a proposal: If France would cut public spending in general, by a third, reduce taxes by as much, and roll back all socialist regulations, I suggest "up", and in a very dramatic fashion. Instead, Valls proposes Wimpy's philosophy Eat Now, Pay Later. The "spiral of debt" which is France, which has not achieved a balanced national budget in four decades, is "unsustainable". However, the French prime minister stressed his commitment to fiscal stabilization and fiscal consolidation, and explained to a large group of German businessmen reforms to labor, tax and administrative level, which aims to save up to 50,000 million for 2017 . 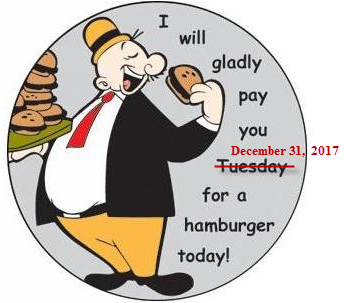 I will gladly pay you in 2017 for a hamburger today. Between now and then, how how many excuses can France come up with to push the date back further? Shockingly, no one has yet proposed "The Law of Excuses", so I get to claim it. I dedicate the law to France: It's Always Something (But Never the Right Thing)!